My name is Sunshine, I am 30 years old and I have 3 children. 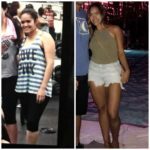 After having 3 kids I found myself at an all-time high weighing 138.5lbs and I’m only 5’2″. I never really even thought I had gained much weight but the scale slowly crept up little by little. I then started going to Gym Rats Boot Camp both Saturday and Sundays. I can now finally say that I love my legs and have worked so hard for my body that I am very proud. I am at my leanest and best personal shape, even after three kids!